The second short track event in the NASCAR Sprint Cup's two-race mini series, teams enter the Martinsville Speedway knowing that this weekend's 500 lap affair on the flat, 0.526 mile oval is a contrast to the high-banked all-concrete oval of Bristol Motor Speedway. Having held a top NASCAR race since 1947, Martinsville Speedway history will this weekend include NASCAR's reintroduction of rear spoiler blades to the Sprint Cup stock car. As was predicted through the week, rain poured on Virginia state and 0.526 mile Martinsville Speedway short track through the Friday afternoon canceling NASCAR Sprint Cup qualifying. With the field set on the newly-established 2010 car owner points, Kevin Harvick narrow point lead margin was all the #29 Chevrolet needed to take the prime starting spot over Roush-Fenway Racing's #17 Ford of Matt Kenseth. While qualifying for the Goody's Fast Pain Relief 500 was scrubbed, an afternoon practice session provided a baseline for where NASCAR Sprint Cup teams measure on the Martinsville Short track. In the practice session, Ryan Newman driving the #39 Stewart/Haas Racing-owned Chevrolet scored fastest lap time at 19.535 seconds, equating to an average speed of 96.934 miles per hour. Running on the tight 0.526 mile bullring, the time differentials of the top 13 cars in the practice was only 1/10th of a second. 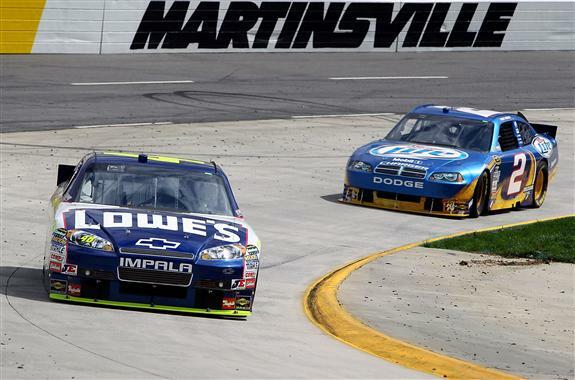 Hendrick Motorsports placed well through the first practice on a track they have won 7 of the last 10 event held. Leading the Hendrick bunch, Mark Martin #5 Chevrolet placed just behind Newman at a time a mere 0.015 seconds slower. Jeff Gordon, Jimmie Johnson as well as Dale Earnhardt Jr were measured 4th, 7th and 15th respectively. Unfortunately with Sunday's grid positions being placed by car owner points, the quickest Hendrick Motorsport car will start deepest in the field in a still honourable 16th place spot. In historic context, Martinsville Speedway had been a stumbling block for Roush-Fenway Racing Sprint Cup program. Often seen charging through the field during the race after slow qualifying times, it would be common to see the Roush-Fenway cars fight up to the top 10. Last season however, the now-Earnhardt-Ganassi Racing driver Jamie McMurray was the only top 10 finisher with a Roush-Fenway Racing Ford Fusion. Rain was probably a welcomed sight to the Four-car Ford operation as David Ragan was the highest placed team car in the practice session in 18th place. Matt Kenseth and Greg Biffle both benefit with top 5 starts for the Goody's Fast Pain Relief 500 on Sunday. As the practice saw the top 2 positions held by Hendrick-built cars, a Michael Waltrip Racing Toyota driven by quick-learning Tasmanian import Marcos Ambrose took third spot. Hoping to turn around a disappointing result in the Food City 500 at Bristol, Ambrose finished 14th in his first run at Martinsville this time last year. Fall race winner of 2009 Denny Hamlin was 5th fastest in the practice but will be haunted early in Sunday's main event by a 19th place starting spot amounting from many misfortunes for the #11 Joe Gibbs Racing Toyota on the first 5 races of 2010. With the Martinsville Speedway round for the NASCAR Sprint Cup series to be set on 2010 car owners points, Terry Cook, Casey Mears and Johnny Sauter wheeling a second Tommy Baldwin Racing Chevrolet failed to qualify. The Goody's Fast Pain Relief 500 at Martinsville Speedway set to begin Sunday at 1PM but weather forecast call for a 70 percent chance of persistent rain in the Virginia state area. Weather permitting, the 6th race in the 2010 NASCAR Sprint Cup Series will be airing on Fox as well as TSN in Canada.